Random Anny .Com: I'm a Jossian Genius! Perhaps you've heard of a little show called Jeopardy? Participants answer mind bogglingly fast questions for points and bragging rights. I think there is a cash prize. Maybe a car. Well look at the above question! 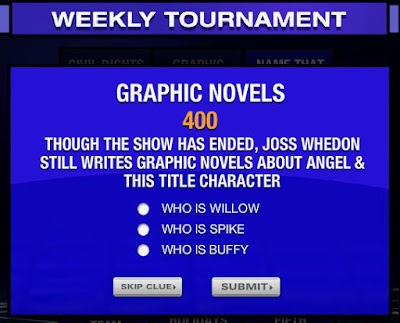 If the Jeopardy folks ever have a Whedonesque ep I must be on it! I'd win so many cars I'd need a driveway to keep them in! Congratulations, Anny, you won the giveaway from Damask Diva and Go Against the Grain on my blog! Email me at embellishedbayou@comcast.net for details.